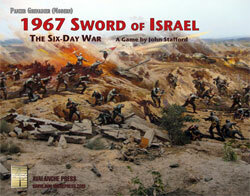 The Six-Day War, launched on 5 June 1967, re-made the politics of the Middle East and much of the world in less than a week. Israel scored an overwhelming battlefield victory, stunning casual observers but not surprising anyone who had paid attention to the military balance of power. Though much smaller than its Arab enemies in terms of territory and population, in 1967 Israel held a substantial military advantage. The Israel Defense Forces mobilized about 250,000 men for combat units, compared to a total of roughly 200,000 among the Egyptian, Jordanian and Syrian armies facing them. While the Arabs mustered more soldiers, many of them could not be committed to the fighting: Egypt had 50,000 men fighting insurgents in Yemen and maintained another 60,000 troops in its major cities to maintain the Nasser regime in power. The Egyptians had about 100,000 men in eastern Sinai to face the Israelis, many of them reservists mobilized in May and fed directly into front-line units to make up personnel shortages. King Hussein of Jordan did not trust his Palestinian subjects and held three of his army’s 12 brigades around the royal capital to defend against his own troops as much as the Israelis. Promised reinforcements from other Arab nations failed to arrive, as the Iraqis and Kuwaitis fell victim to Israeli air attacks and the Saudis temporized to see how the war progressed before committing their troops. Israeli tankers mount up in their Centurions. And the Israeli advantages went far beyond numbers. 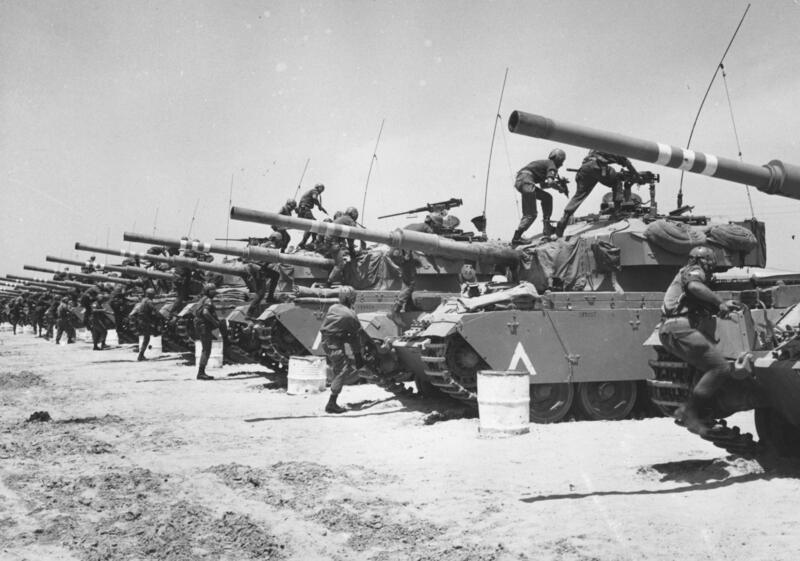 While the Israelis thought highly of the modern Soviet-made T54 and T55 tanks of the Syrians and Egyptians, even these were outclassed by the Israeli M48 Patton and Centurion tanks with the excellent British-made L7 Royal Ordnance 105mm rifle the Israelis had fitted to their first-line tanks. The Jordanians fielded modern American and British tanks – M48 Pattons and Centurions – but lacked the modified armament of the Israeli vehicles. Except for the Jordanians, all of the participants fielded World War II era tanks in their second-line brigades, including unmodified Shermans for Israel and Egypt and T-34/85 tanks for Syria and Egypt. Huge purchases of Soviet-made equipment gave the Egyptians a serious edge in artillery, communications gear, armored personnel carriers and support weapons. But many Egyptian soldiers could not properly operate their new weaponry, and the Egyptian government resisted bringing in large numbers of Soviet advisors to correct that shortcoming. Training, small-unit leadership and morale gave the Israelis an even greater edge. Israel simply had a better-educated population on which to draw for its junior officers, and the Arab governments did not trust their own educated classes: the Syrian Arab Army actively promoted its stupidest officers, to assure that they would not have the mental acumen to foment a coup against the Ba’athist regime. While less paranoid, the Jordanians gave marked preference to Bedouin candidates over Palestinians and urban Arabs from Transjordan, robbing the Army of potential talent. 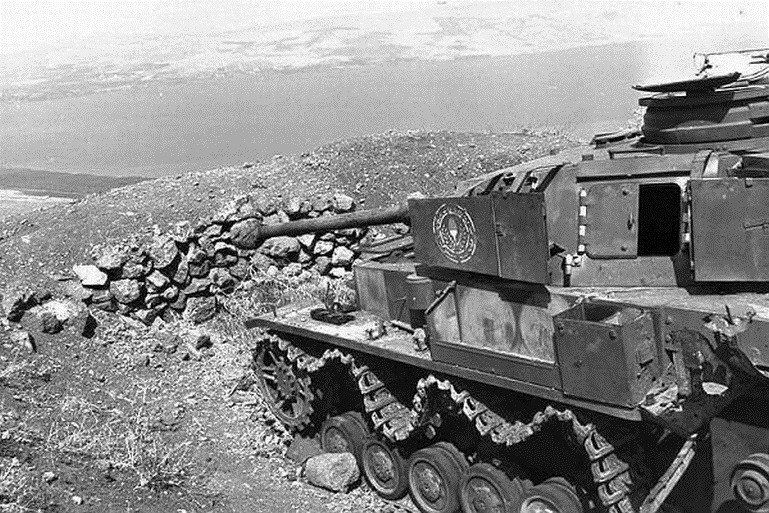 A PzKpfw IV of the Syrian Arab Army on the Golan Heights, 1967. Finally, the Israelis held a massive advantage in military intelligence. Israel had deeply penetrated the Syrian defense ministry and maintained massive human and signals intelligence efforts aimed at all of their neighbors. The Israelis had detailed orders of battle, deployments and doctrinal outlines. They knew how and where the Arabs planned to fight, and made their own attack plans accordingly. The Arabs did nothing. They had only a vague idea of Israel’s military strength, other than an appreciation that it outmatched their own. Only in the air did the Arabs have the advantage, and the “fighter pilot mafia” that dominated the civilian and military leadership in both Cairo and Damascus expected a great deal from the Egyptian Air Force. Egypt alone fielded 450 modern combat aircraft, mostly Soviet-made MiG and Ilyushin jets, against Israel’s motley collection of 257 French-made jets. Syria added another 100, while Jordan had 21 British-made Hawker Hunters and Iraq promised to commit two more squadrons of Hunters. Once again, numbers prove deceptive. The Israelis had substantially better pilot training, access to replacement pilots, operational doctrine and sortie rates: their planes were better flown, better directed and better maintained. Egyptian pilots had far fewer hours in the air, were usually trained for only one mission, and like their comrades in the ground forces served in a rigid hierarchy allowing for little initiative. Many Egyptian officers and troops had recent combat experience in the ongoing civil war in Yemen, but the war there drew away many of the army’s best young officers as combat experience there could catapult them up the career ladder. About half of the army’s foreign-trained officers were in Yemen when the Six-Day War broke out, robbing the field army of vitally-needed leadership. As tensions rose during May 1967, the Egyptian commander-in-chief, Field Marshal Abdel Hakim Amer, replaced all of his division commanders along the front facing Israel, removing political appointees – for the most part, his own supporters – and putting combat veterans of the Yemen war in their place. The Egyptians adopted a fairly sound defensive strategy relying on infantry fighting from fixed fortifications backed by armored formations which would counter-attack Israeli penetrations. But they’d built those fortifications to Soviet specifications, without taking terrain into account and with the belief that Israeli armor could not maneuver through the sand dunes of northern Sinai. 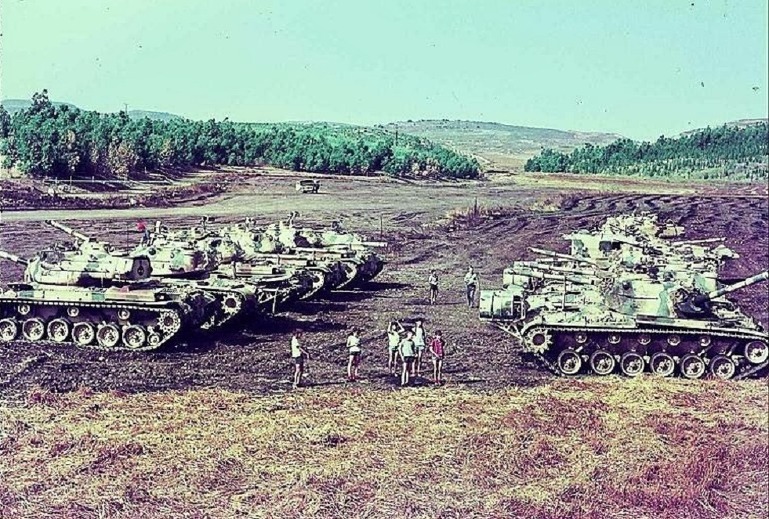 Jordanian M47 Patton tanks captured by the Israelis, 1967. Jordan assented to a formal alliance with Egypt on 30 May, placing her armed forces under what was known as the Unified Arab Command. As part of the alliance command structure, Amer dispatched his second-in-command, Abdul Munim Riyad, to command the Jordanian front against Israel. As part of Egypt’s commitment to Jordan, the Egyptians also sent two regiments of commandos hardened by tough combat in Yemen and promised to provide air cover to the Jordanian forces. Riyad, a well-respected professional, visited Damascus on the 31st to confirm Syrian participation and arrived in Amman on 1 June. He spent the next day arranging the dispatch of troops from Iraq, Kuwait and Saudi Arabia to bolster his command. On the 3rd he toured the West Bank, meeting that evening with the king and his senior generals to begin plans to defend against Israeli attack. Riyad, having arrived with only a tiny staff and counting on the Iraqis to provide part of his headquarters team, soon found himself in deep command difficulties. As one aspect of the widespread paranoia that informed Arab military planning in 1967, the Royal Jordanian Army had no formation larger than a brigade – all 12 Jordanian brigades reported directly to GHQ. Re-aligning them overloaded his staff’s capacity. When the war began on the 5th, he had not yet issued any new deployment orders, nor had previous Jordanian war plans been confirmed. Riyad arrived too late to have much effect on the Jordanian war effort, while his absence from Cairo left the Egyptian Army without a capable commander when Amer suffered a nervous breakdown on the war’s second day. For their part, the Syrians made few adjustments. The Syrian Arab Army relied on relatively few reservists, and did not need an extensive mobilization period to prepare its sixteen brigades for war. But that preparation consisted of issuing ammunition and little else; the Syrians had built stout defensive positions with the aid of Soviet advisors and then done nothing to maintain them. The extensive minefields laid in previous years had been allowed to wash away in the heavy spring rains and nothing had been done to replenish them. Syria had modern Soviet arms for the most part, but their troops were poorly trained and their officers even worse. Months of rising tension had made war highly likely by early June 1967. Israel was ready. Her opponents were not.